Block print chanderi churidar suit material supplier are well known to produce massive collection of suit pieces. Each and every material are exclusively designed in such a way that our clients can easily avail from assorted collection of their choice. In order to ensure best quality, our experts uses supreme quality materials in order to obtain best quality product. With perfect blend of traditional as well as modern design, our block print chanderi salwar kameez material provides utmost comfort to the wearer. 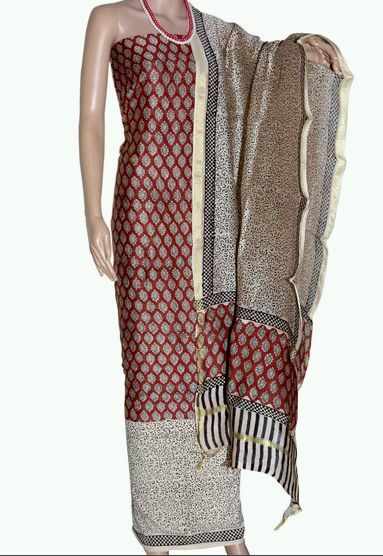 However, our block printed suit material is perfect enough to offer ethnic look to the wearer. Suit size 2.40 meters app. Dupatta size 2.40 meters app.